S.A.S.S. CLUB OF THE YEAR for 2011 !! Welcome to the Merlin Marauders Cowboy Action Shooting Posse! Dress up in any manner you might have if you were living in any period from 1850 to 1899. Engage in friendly competition, shooting the firearms of that period in time. You may find yourself blasting away at steel “bad guys”, saving (or robbing) the stagecoach or Union Pacific, defending the town from marauding renegades, or saving one of the local Saloon gals (always capitalize “Saloon”) from “a fate worse than death”. ….. Cowboy Action Shooting is the fastest-growing shooting sport in the world, and is embraced by men, women and youngsters from all parts of the globe where folks have the freedom to engage in the safe use of firearms. So…Come on out and watch, talk with us, and maybe even try YOUR hand at puttin’ down those “bad guys”. The folks are friendly, and the “Spirit of the West” is alive!! Check-in from 9:00 to 9:30, Shooters’ Meeting at 9:45 and first shot downrange at 10:00! Check in as soon as you arrive so we can get you in the computer, shooting the category you want and with the pards you want to shoot with! 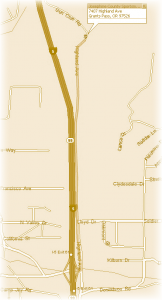 Directions: Take the #61 exit off I-5 and turn East 1/2 block to Highland, then turn left. Highland dead-ends into the Park. All documentation and imagery on this website is property of the Merlin Marauders and its’ members and cannot be used without prior permission from the club.